As one of the premier vacation rental resorts in Orlando, Windsor Hills offers families and groups a home away from home in high-end accommodations from two-bedroom condos all the way to seven-bedroom villas. A recent expansion to the resort’s pool facilities outside the main clubhouse now provides guests with a fun water park experience of two thrilling slides and a large children’s wet play structure. While this gated community is less than two miles from the entrance to Walt Disney World, some guests prefer to spend hours splashing around at this brand new aquatic amenity where a ticket is never required. ADE was brought on board to envision an aquatic amenity that would be a major attraction for visitors booking their vacation to Orlando, America’s most-visited destination. Windsor Hills not only competes with other rental communities in the area, but also the on-property theme park resorts that offer alluring water park elements at their own pool areas. The existing pool deck featured a resort-style pool with a slide and zero entry, but it lacked the wow factor that would make this vacation rental property a standout choice. Through a preliminary design phase, our team developed a series of options for how best to replace an aging adult spa area with family-friendly and exciting water park elements that fit into a 6,500-square-foot area adjacent to the pool deck. 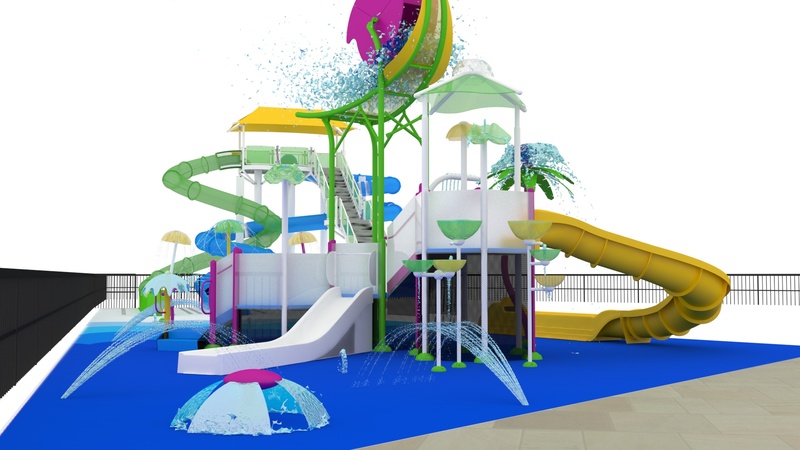 In carefully considering the constraints of the space and the budget, we delivered a detailed rendering of the area, showing a 23-foot-tall slide tower with two twisting slides and an interactive water feature and play structure with two children’s slides and a water wheel on top. These 3D images of the new water park area were used as a major selling point for the individual owners who rent their properties up to two years in advance. The elements of this water amenity have been placed into a very compact area, which can sometimes lead to engineering challenges when determining where to locate mechanical systems and other pumps and reservoir tanks. For this site in particular, it was bordered by a concrete retention wall that dropped off into a wetland area, leaving no room for using any adjacent underground space. 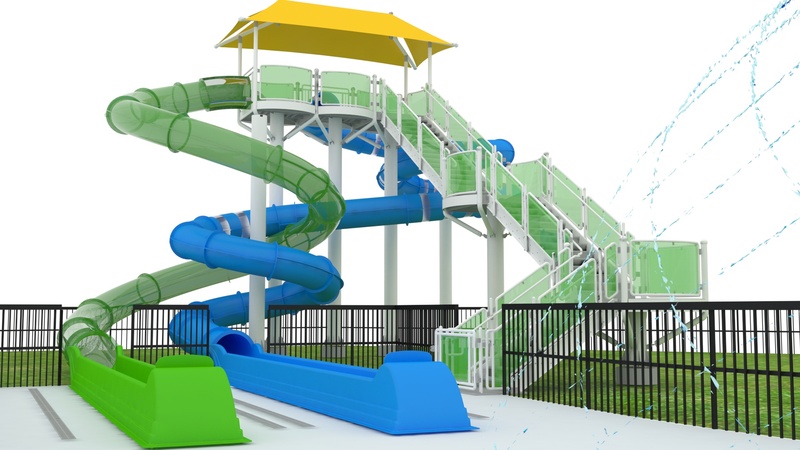 Our engineers opted to locate several equipment vaults behind the slide tower, which served to hide these mechanical cabinets on the edge of the site and out of view from the guests enjoying the water slides and wet play structure. Another choice our engineering team made was in specifying a soft flooring for the entire expansion. Using a slip-resistant and cushioned tile such as Life Floor helps lessen the risk of injuries, a subject addressed on the liability insurance for the Windsor Hills Homeowners Association. Not to mention, the customizable floor tiles allowed our creative team to design a vibrant and colorful pattern that sets this pool area apart. With its dueling water slides, spraying nozzles, and pouring water wheel, this is one attraction that offers fun for the whole family, without lines or a price of admission. Families can rest assured that their time spent at Windsor Hills’ new water park will bring as many smiles as their time in the theme parks.